French Revolution occurred during 1789 to 1799 during which string of events altered the whole political and social structure of France. During this revolution, the French monarchy was replaced by democratic system while liberalism and secularism eradicated the importance of religion in the matters of state and society. · Due to participation in Seven Years’ War (1754-63) and American Revolutionary war(1775-84), the economy of France suffered badly due to which France imposed unpopular taxes on common people while deregulation of grain increased the prices of bread. Due to bad harvest, the bread became scanty for common people while the regime failed to control the situation. · Philosophers like Voltaire and Rousseau had made Paris the centre of Enlightenment movement in the second half of 18th Century. The emphasis of the movement was on reason and rejection of religious dogmas. This philosophy influenced the people on larger scale especially the middle class who were skeptical of Catholic doctrines. · The newly established United States of America adopted the constitution with separation of power in a govt. and many French thinkers were advocating this form of government in place of absolute monarchy as a solution of problems. Due to financial crisis, King Louis XVI summoned the Estates-General in May 1789 in order to find solution of the problem. Estates-General was the representation of First State (the clergy), Second State (the nobility) and Third State (common people) while the last meeting of Estate-General was called in 1614. Due to differences, the Third State (common people) established National Assembly on 13th June 1789. 47 members of nobility and most of the clergymen also joined them and the National Assembly was replaced by National Constituent Assembly on 9th July 1789. In August 1789, NCA abolished feudalism in France (which deprived nobility and clergy from tax collection) and passed legislation of Rights of Man and Citizen which gives equal rights to all the citizens of France. The first major step that initiated the revolution was Storming of the Bastille on 14th July 1789. 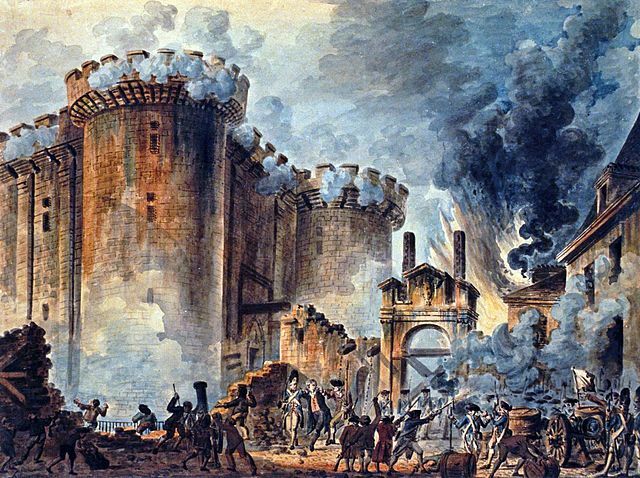 The commoners’ militia National Guards was behind the Storming of the Bastille while the reason of this raid was to show support and strength of National Assembly against monarchy. The prison of Bastille at the centre of Paris was representing royal authority. After capturing the Bastille, the insurgents killed the Governor of Bastille along with few other soldiers while around 100 attackers were killed by the Guards of prison before the capture of the prison. On 5th October 1789, thousands of women from Paris marched towards the Versailles (royal palace) along few canons and small weapons. Their demand was to take the king and royal family with them to Paris so that they could view the miserable condition of shortage of bread. These women forced the king, royal family and the French Assembly to return to Paris. The women were agitated and supported by revolutionaries. This event is known as Women’s March on Versailles. In 1789 and 1790, several laws were passed by the National Assembly to decrease the power of Church. Under these laws, Clergy were unable collect tithe (10% tax) from peasants while land of the Church was declared on the disposal of state. The new assembly sold a part of this land to highest bidder in order to decrease financial crisis. All religious orders were dissolved in February 1790. On 12th July 1790, clergy became employees of state after the Civil Constitution of the Clergy. But more than 75% of clergy rejected the option of taking oath and they remained loyal to Roman Catholic Church of Rome. This refusal led to harsh treatment against clergy. When the situation became horrible for Louis XVI, the king and the royal family decided to flee towards the area near Austria where the faithful commander General Bouille assured the royal family his complete support. The royal family escaped from Tuileries Palace on the night of 20th June 1791 while wearing the clothes of servants but could not reach their destination. On 21st June, the king was recognized by a postmaster at Varennes and the royal family was taken back to Paris while they were 50 km away from their final destination, the Fort of Montmedy. This failed escape attempt by royal family is known as Flight to Verennes and the event increased hatred against king and royal family. On 10th August 1792, National Guards and other revolution-supporting militias invaded the Tuileries Palace. Just over 1,000 Swiss Guards and other loyal were there to defend king while they were heavily outnumbered by more than 20,000 attackers. Swiss Guards (known for their loyalty and discipline) defended the palace till the surrender by King Louis XVI. Most of the Swiss Guards lost their lives during the process and the king practically became a prisoner. Between 2nd and 7th September 1792, around 1500 prisoners from all the prisons across Paris were executed by National Guards. This step was taken due to fear that these prisoners could join the invading forces of foreign nations and loyalists of monarchy. Several prisoners of other cities also face the same fate. Many priests were among the victims. The French Constitution of 1791 replaced absolute monarchy with constitutional monarchy but the constitution was short-lived and France became a republic on 21st September 1792 after abolishing monarchy. Different monarchs of Europe were worried about the situation of France. Holy Roman Emperor Leopold II was the brother of French Queen Marie Antoinette. He and Prussian King issued the declaration for protection of Louis XVI and royal family in August 1791 after consultation with French nobles. In retaliation, France declared war against Austria in April 1792. After initial defeats, French military started to achieve victories after Battle of Valmy in September 1792. These victories gave so much strength and courage to the French govt. 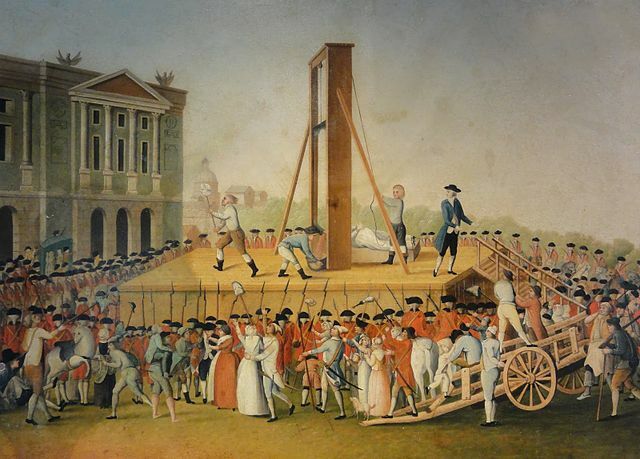 that they executed French emperor Louis XVI on 21st January 1793. Britain, Spain, Portugal and several other European countries joined anti-France alliance 1793 after execution of Louis XVI and the war became the War of the First Coalition. The war ended in 1797 with victory for France and emerging General Napoleon Bonaparte came as hero for many of the French victories. Vendee is the western part of France where people (mostly peasants) were most religious and they openly revolted against the stance of revolution about Roman Catholic Church. The War in the Vendee broke out in March 1793 after passing of conscription laws by the Republican regime in February 1792. The uprising was supported by royalist supporters and Great Britain. After initial defeats, Republicans were able to uproot the rebellion. Main part of the war ended in December 1793 with the decisive Battle of Savenay. The Committee of Public Safety was formed in April 1793 in order to protect the revolutionary France against internal rebellion and foreign threats while members of the committee were given enormous powers. In July 1793, a radical member of Jacobin Club Maximilien Robespierre became head of the committee who started summarily execution of the enemies of revolution while the executed also include moderate members of the revolutionaries (Girondins). 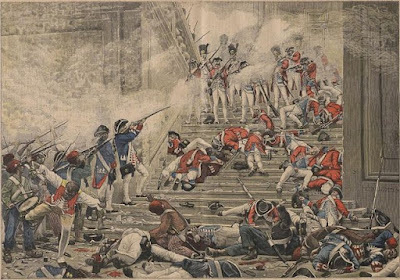 Due to these atrocities, the period from September 1793 to July 1794 in French Revolution is known as Reign of Terror. On 24 June 1793, the National Convention accepted the constitution drafted by the Committee of Public Safety. This constitution is known as French Constitution of 1793. Abolition of slavery, popular sovereignty, public assistance were important points of this constitution. Robespierre was strengthening his position in the Committee of Public Safety due to which several members of the committee along with several moderate Jacobins were worried about their safety. This situation gave rise to a coup within the committee as these members of committee executed Robespierre and over 150 of his supporters with the help of National Guards and Girondists on 27th July 1794. This event is known as the Thermidorian Reaction (Thermidor was 11th month in French Republican Calendar) which ended the Reign of Terror. On 22nd February 1795, the Convention approved the French Constitution of 1795 which replaced the previous French Constitution of 1793. Under this constitution, the period of new regime of France, The Directory, started. The Directory operated with a combined leadership of five directors but it was lacking popular support from its beginning. The Directory could not control the economic condition due to shortage of food following 1795 crop failure. Though the directory denounced the atrocities of Reign of Terror but the regime used cruel measures against its opponents. Their famous achievements were due to military successes against neighboring countries and in crushing the Vendee rebellion. Later on 9th November 1799, Napoleon overthrew the Directory and established The Consulate and Napoleon Bonaparte became the First Consul. This event started the Napoleon era. · Before revolution, France was an absolute monarchy where all the decisions were taken by the king. The Estate-General was there to represent the clergy, the nobility and the common people but it was not called since 1614 while its role was also more or less advisory. Clergy also had immense powers which can collect tithes (10% of harvest) from peasants while its land was free from taxation. French Revolution crushed the power of both these pillars of government. The absolute monarchy was replaced by a democratic republic while all the power and land of clergy was taken by the revolutionary regime while clergy became servants of state and France became a secular country based on the principles of enlightenment and liberalism. · The French Revolution affected the outer world also a lot. In the beginning, monarchs from different parts of Europe took part in the campaign against the revolutionary France in support of French monarchy as these monarchs were feeling insecurity from this revolution which can also affect its own people. Major role in this campaign was played by Britain and Holy Roman Empire. Later, French Republic also tried to export the revolution in the areas it captured (Netherlands, Belgium, Switzerland, Italy etc.). · Initially, thinkers and philosophers in many parts of Europe were in favor of the French revolution but the large scale killing of people (including many innocent people on mere suspicion) forced them to change their mind and no such revolutionary thoughts appeared in other countries of Europe. Instead, many countries by themselves changed absolute monarchy to constitutional monarchy in order to prevent any such bloodshed in their countries.